Category Archives: Voltage Pictures Inc.
"Hacker" Lawsuits, "Named" Defendant, AF Holdings LLC, Anti-Piracy Law Group, Copyright Trolls, CP Productions Inc., Guava LLC, Ingenuity 13 LLC, Paul Duffy, Prenda Law Inc., Steele Hansmeier PLLC, Torrent, Uncategorized, Voltage Pictures Inc.
We learned this morning that John Steele was arrested under 17 counts of mail fraud, wire fraud, money laundering, and perjury. I have detailed the charges lower down in the article, and a link to the Star Tribune article can be found here (and sincere kudos to both DTD & SJD for breaking this story). The link to the indictment itself can be found here. For those of you who became readers more recently, one of the first prolific copyright trolls was John Steele, formerly from Steele Law Firm PLLC, then from Steele|Hansmeier, then most popularly, from #Prenda Law Inc. (that last name even earned itself a hashtag and a group of followers on Twitter). In short, there is so much to say about this story which has been an evolving saga since 2010 (now six years and counting). 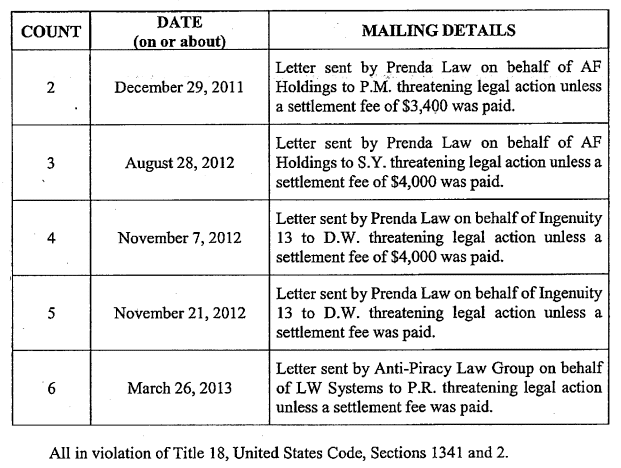 Many internet users were hurt by their activities, and the injustices that John Steele, the Hansmeier brothers, Mark Lutz, and the others more well known as “the Prenda gang” perpetrated on so many thousands of accused John Doe Defendants are still being copied by many copyright troll attorneys even today. My personal opinion is that this arrest should be a warning sign to other copyright troll attorneys who are still filing lawsuits against John Doe defendants even today using the same tactics described here. The scheme described in the indictment has not been stopped, and it continues (albeit in more hidden forms where attorneys go through such great lengths to make their outfit appear legitimate). My only message to the other copyright trolls perpetuating this scheme is not that “I’m watching,” or that “you’re being seen by the internet bloggers for what you are,” but that the U.S. Federal Government is watching. 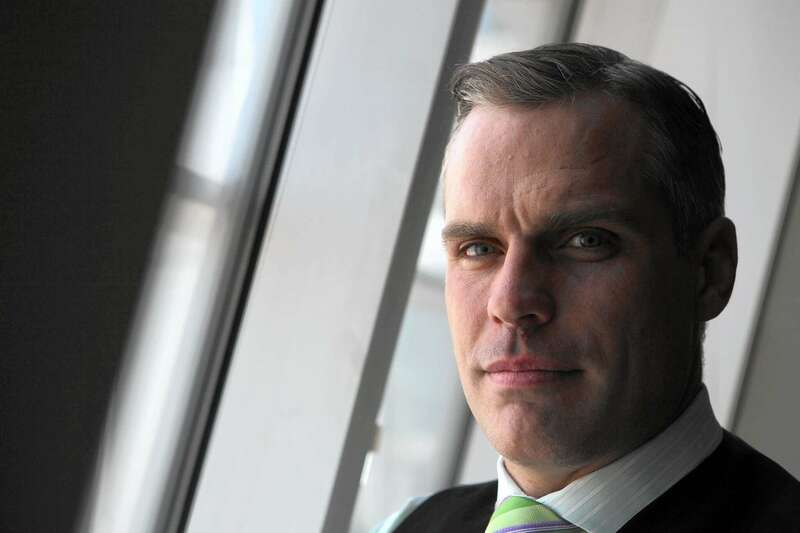 John Steele’s problems are not over. There are still other departments likely analyzing their activities. The one department that comes to mind is the Criminal Law Enforcement arm of the Internal Revenue Service (IRS). …and likely many others to come. Copyright Trolls, Millennium Films, Torrent, Voltage Pictures Inc.
A rant about poor quality Hollywood content & distribution. I thought that TAC’s response to my article last night deserved a spot of its own, so I am pasting it below. In short, he’s right. 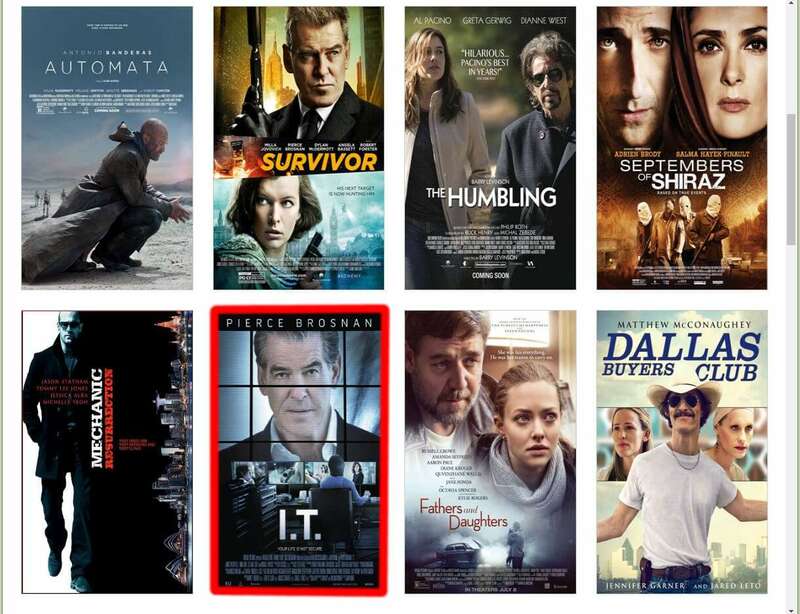 As a lawyer, I get so caught up with each individual client and defending whether copyright infringement actually happened or not that I overlooked the big picture “elephant in the room” point — that if the movie production companies would actually make good content which would inspire someone to buy a movie ticket, and if they would make that good content readily available rather than blaming downloaders for a few bucks of loss of revenue, then piracy wouldn’t even be a problem. I used to be a movie buff. I would see every movie in the theaters, and if there was something I missed, I would catch it later when it came out on DVD. However, the… pardon my language… “crap” that has been coming out of the theaters over the last ten years has lost me as a fan. I cannot remember the last time I saw a movie and felt that I got my money’s worth. More often then not, I leave the theater feeling cheated. The internet created a problem for the movie companies where it enabled average internet users to share digital copies of movies which [by definition of being “digital”] are the identical quality as the files burned on DVDs from which they are ripped. They tried to stop the copying through creating privacy measures that blocked an individual from being able to copy videos, but individuals got around those protections. Then they passed the Digital Millennium Copyright Act (“DMCA”) statutes and made it a crime to unblock the copy protections, but people did it anyway. Then they sued the downloaders and claimed they were going after the lost revenue, but instead, they went after statutory damages of $150,000 per instance of infringement. In the process of suing downloaders (rather than suing the initial uploader or working to take down the infringing videos), with the birth of the Dunlap Grubb and Weaver, LLC Voltage Pictures, Inc. “Hurt Locker” and “Expendables” lawsuits, Voltage Pictures, Millennium Films, and other production companies turned their failed b-rated movies into a money-making extortion-like shakedown scheme where they asked for tens of thousands of dollars for what was really the loss of a movie ticket or a DVD rental. The point is that Hollywood and their production companies spend so much time trying to clamp down and stop people from getting content that if they spent those same dollars finding new ways to make content readily available, they would stop the piracy problem (or at a very minimum, they would convert many would-be pirates into paying customers). Netflix, Amazon Prime Video, and Redbox have the right idea of trying to find ways to get movie content into consumers’ hands, but even they run into licensing problems where the Hollywood movie studios won’t let them provide content to their subscribers (and thus great movies and TV shows are commonly lost to history). This argument has gone around in circles for many years. Point being, the movie companies have obviously chosen that their focus will be to clamp down and spend their money to fight the losses from piracy rather than innovate and make good content that would inspire people to open their wallets and pay for a movie ticket or rent a DVD. This is my point, this is my feeling, this is how I see things. I could be wrong, but who cares. Unless I see quality new content in the theaters (and not recycled old story lines), I’m not buying a ticket. Superman versus Batman?!? Really? Yet one more Borne Identity?!? Really? Ice Age in Space?!? Really? How many times can I hear the same story told over and over again? I’m honestly bored of all of this recycled media crap and I wish they would start looking for new and original content. Thus, in all fairness and thanks to “That Anonymous Coward (TAC),” below is his comment to last night’s “We are winning the bittorrent piracy war against copyright holders, but what are the unintended consequences?” article which inspired this entire line of thought. And there in lies the biggest problem. People look at Popcorn Time, and don’t understand how it works. They might assume that its just an awesome service. It works like everyone imagines we should be able to get content. The “war” has always been pointless. Everything done to “stop” pirates, ends up punishing paying customers… and eventually when you hassle paying customers enough they look for other ways to get the content. We’ve missed out on technology moving forward, because of screams that it MIGHT hurt the bottom line of an industry that has its own special ‘accounting’ practices that manage to make a world wide blockbuster look like it lost money. They aren’t honest about their books, they aren’t honest about actual harm, they aren’t honest about why they refuse to stop punishing paying customers & creating more consumers that might turn to piracy because it meets their want for the content how, where, when they want it that the industry can’t seem to understand. When they cling to an outdated business model, ignoring the consumer demand for access, they have forgotten they are in business to sell content… not impose pointless control over people who already paid them who get treated worse for playing by the rules. Imagine what they could have done with all of the time and money they have dumped into the anti-piracy schemes (that never pay that well or accomplish what is promised) and had used it to “fix” the horrible patchwork of laws & rules to create a unified worldwide business model that makes getting the content customers want faster & easier. But then they would be making more money they they ever imaged possible… but would still be imagining there is a dollar out there they aren’t getting & end up harming paying customers chasing the imaginary dollars.